^ Mark Russell (April 29, 2014). K-Pop Now! : The Korean Music Revolution. Tuttle Publishing. p. 106. ISBN 978-1-4629-1411-1. ^ "Psy brings 'Gangnam Style' to 'SNL'". USA TODAY. Retrieved April 27, 2018. ^ "PSY Teaches the "Arrogant Dance" on ABC's "Live with Kelly and Michael" | Soompi". www.soompi.com. Retrieved December 7, 2017. ^ "Live With Kelly and Ryan". TVGuide.com. Retrieved December 7, 2017. ^ "MuchMusic Video Awards: Drake Surprises and Wins Big, PSY Retires 'Gentleman'". Billboard. Retrieved December 7, 2017. ^ "No, Psy's 'Gangnam Style' Did Not Break YouTube Video Counter". December 5, 2014. ^ ji sook, lee (November 30, 2015). "싸이 '3년 5개월만에 컴백'". ^ "함께 만드는 기쁨 SBS". SBS (in Korean). Retrieved January 4, 2018. ^ "PSY Returns With New Album & Star-Studded Music Videos". Billboard. Retrieved December 7, 2017. 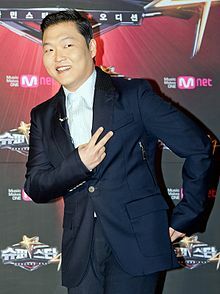 ^ "Psy Exits YG Entertainment After 8 Years". Billboard. Retrieved September 5, 2018. ^ Anna Almendrala (December 20, 2012). "Psy Buys Condo In Los Angeles' Exclusive Blair House (PHOTOS)". The Huffington Post. Retrieved December 26, 2013. 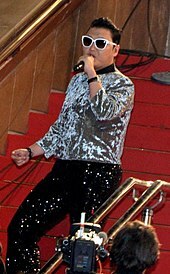 ^ Park Si-soo (April 5, 2013). "Who are celebs with big income?". Korea Times. Retrieved January 23, 2015.